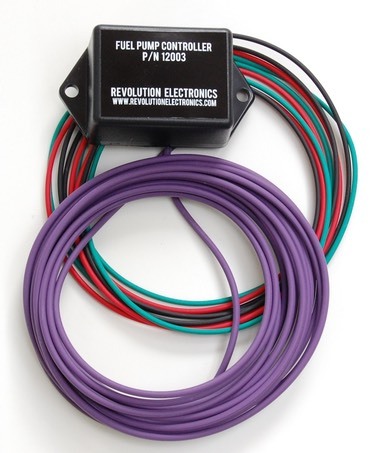 This universal electric fuel pump controller is designed for cars and trucks being upgraded from a mechanical fuel pump to an electric inline or in-tank fuel pump. Pump only runs if there is a tach signal from the ignition. Primes the pump for three seconds at initial key-on. Includes a 7.5 amp circuit breaker. Includes 15 feet of 16 gauge wire to energize the fuel pump. "…your controller is working perfectly. And the 3 second prime could not be more useful! Thank you for a great product and a peace of mind." Many years ago, back in college, my ’65 was my “daily driver” but didn’t get driven daily. One problem I had was that the fuel would evaporate out of the carburetor bowls between uses. I would have to crank the car for several seconds just to pump fuel up to the carb. I really didn’t like that, so my solution was to add an electric fuel pump. With an electric fuel pump, I would just turn the key on allowing the pump to run a few seconds, tap the throttle, crank the engine, and she would come to life quickly. The only problem with my setup was that the electric fuel pump was “hard wired” to switched power. We all know this isn’t safe and I knew it, too. If I had been in an accident, that fuel pump would keep running as long as there was power available, potentially dowsing a fire with ever more fuel. The solution that most people implement is the “oil pressure switch”, but that didn’t allow me to prime the fuel bowls before startup and that was the main reason I had converted to an electric fuel pump. The most common solution to this new problem is to hide a “priming button” under the dash to bypass the oil pressure switch. When you get in your car and turn the key on, you are supposed to press this hidden button for a few seconds to activate the electric fuel pump, priming the bowls. Yeah, that works, but it seems too kludged for me. I like things which are a little more automatic. Besides, when the wife must use the car, are you really going to explain all this to her? I didn’t think so. For the 6V vehicles, we have a version just for you. Same functionality and features, but designed to operate at 6V instead of 12V. Perfect addition to your 6 volt Carter (TM) or other brand electric fuel pump. Internal 7.5A resettable circuit breaker.